METALISTAS LT UAB is one of the oldest and most successful metal processing companies in Lithuania. It started its activities in 1960 with construction bindings and furniture fittings’ manufacturing. Today the company is one of the leading Lithuanian manufacturers of timber connectors, furniture fittings and non-standard products, offering a wide range of products, services and technical solutions. The company seeks its aim of becoming the metal processing company that uses the most advanced methods in the Baltic states through continuous investment into process development and increasing the flexibility and promptness of solutions offered. METALISTAS LT offers metal processing services for building and machine industry companies, manufacturers of furniture, individual enterprises. The works cover all stages from design to mass production. Uniqueness for the client is guaranteed by a variety of added services: metal tempering, powder and wet coating, zinc coating, assembling and others. The Company bases its activities on four main values that distinguish it from other metal processing companies. These values are quality, speed, flexibility and courage. Using these values, we create long-lived, mutually beneficial and open partnership. We carry out metal preparation works: we cut sheet metal into up to 6 mm thickness strips, we cut pipes, sections, strips up to 290 mm. We grind using universal machine-tools (product diameter up to 630 mm, length - up to 3,000 mm). We mill using programmable and universal milling machine-tools. We carry out coordinate boring. We cut using wire and the electro-erosion method. We roll sheet steel (up to 12 mm thickness and 2,000 mm length). We bend pipes (diameter from 22 up to 70 mm, wall thickness – 1.5 – 4.00 mm, length - up to 6,000 mm). Metals are tempered and cemented. Tempering imbues metal products with optimal performance features. The method of tempering is chosen according to the product size, the complexity of the shape, the content of steel and the requirements to which the product must correspond. Tempered part measurements: length - up to 600 mm, width - up to 400 mm. Thermally treated parts’ hardness is estimated according to the HRC scale. 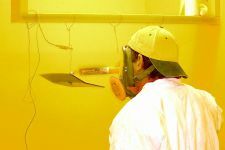 Powder coating in the electrostatic field gives long-time anti-corrosive protection to metal surface. The surface remains unchanged not only under adverse weather conditions, but also under conditions of a chemically aggressive environment. Surfaces covered with powder are strong and resistant to mechanical impact and possess positive aesthetic features.The colours are chosen according to the RAL scale. Metal surfaces are covered with a 60-120 micron layer. Measurements of coated metal parts: length - up to 1500 mm, width - up to 1300 mm. Before powder coating, metal surfaces are prepared. The thickness of paint is measured using the device Elcometer 345.